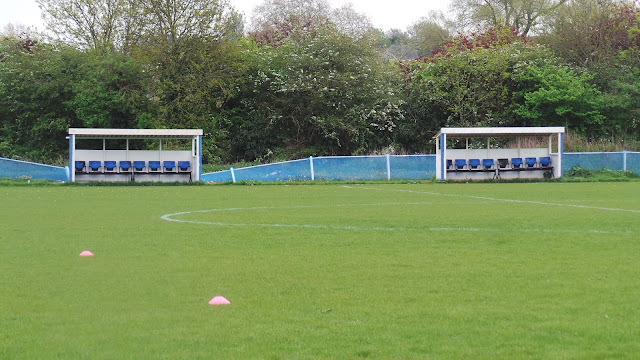 The club was formed in 2010 following the collapsed merger of two local clubs. 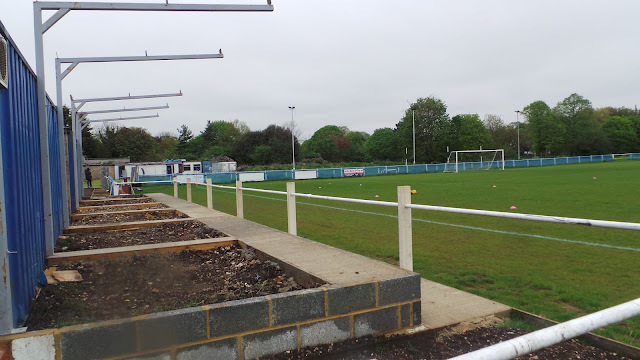 Erith Town eventually pulled out, but the other club, Dartford Town, can trace their history back to 1999 with their later years spent in the South London Alliance. Originally known as Erith & Dartford Town, they changed their name to Kent Football United in 2012. 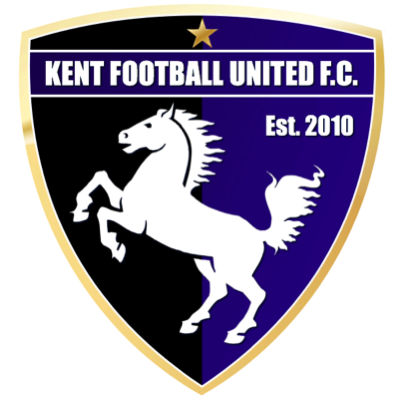 The club was a founder member of the Kent Invicta League in 2011 but generally struggled and finished in the bottom half. The league was absorbed into the Southern Counties East League at the start of last season and this saw a huge upturn in fortunes with a very credible 4th place finish. They would be matching that this season but have had 12 points deducted for four separate three-point fines for playing ineligible players and as a result, sit 9th after last weekends games. 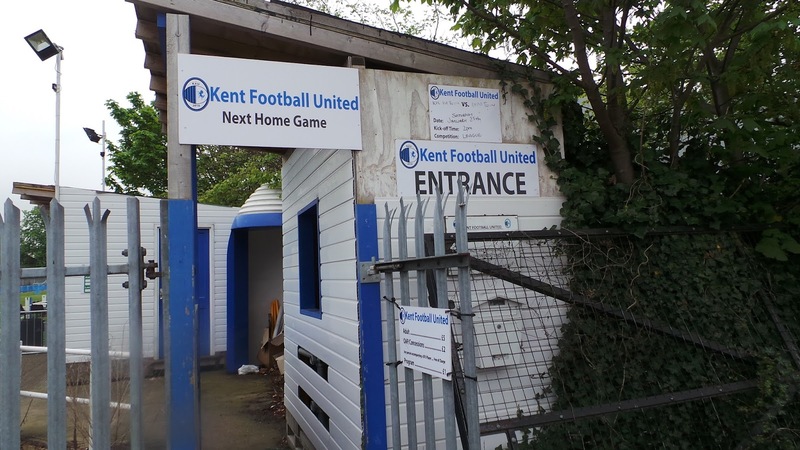 Kent Football United have not yet played in the FA Cup due to lack of facilities and for the same reason, no longer compete in the FA Vase. They did play in the latter for three seasons thanks to a groundshare at VCD Athletic. 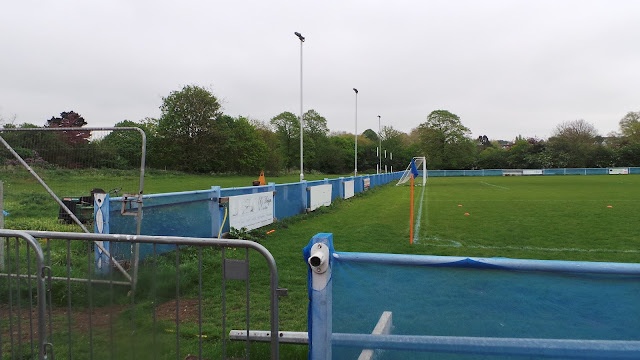 They went out at the first hurdle on each occasion, their best performance seeing them take Lingfield to a penalty shoot-out after a 3-3 draw. 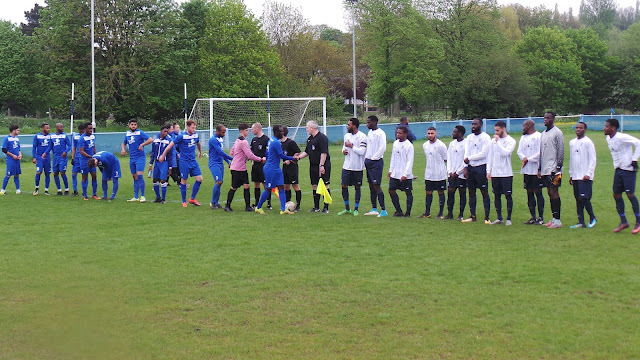 There have been no local honours, but 2013/14 saw the team reach the Quater Finals of the Kent Invicta League Cup, London Senior Trophy and Kent Hospital Cup. 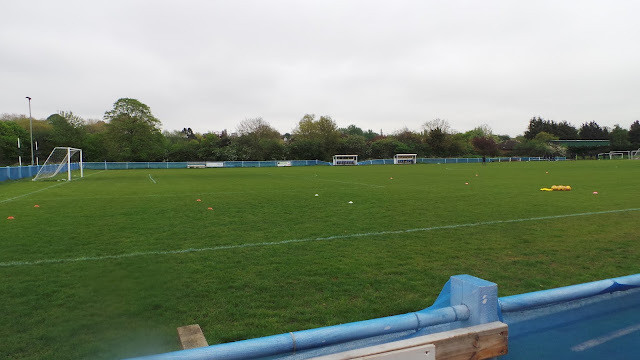 The club also has a number of other teams - including a ladies side and several junior teams, The most well-known player to turn out for the club is winger Justin Amaluzor - he kicked off his senior career with 4 appearances on loan at Kent Football United, whilst on loan from Barnet. He went on to make 28 appearances in the Football League, scoring once. He's since played on loan for a number of non-league clubs, the latest being his current one at Bognor Regis Town. I'd known that I'd be doing a groundhop on this Saturday, as Wycombe were playing up at Chesterfield and I had been there last season. It was one of the awaydays that I enjoyed, but any chance of a late reconsideration to go was put to bed by a terrible home performance and a 4-0 defeat to Accrington Stanley on the previous Saturday. There was a football shirt exhibition in London that I wanted to go to and also I like to visit Borough Market whenever I'm there, so it was going to be a trip on the train. In the end, there was only one new ground out of the 50 plus fixtures in London on that Saturday and it was a fairly basic one. But after doing my research, I started to look forward to the game and with it being based in Dartford, I'd also be able to tick a new Wetherspoons for lunch before walking to the ground. I was originally going to go to a game in the Wessex League the night before but I knocked it on the head. It turned out to be a wise decision. I grabbed a much-needed nap in the afternoon and as it turned out, a lot of the games were called off due to rain anyway. 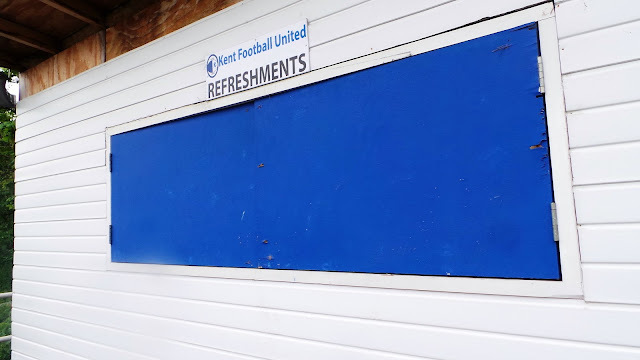 The evening was spent updating my Dunstable Town blog which took a lot longer than usual due to the club's interesting history. I was happy to hear the return of the Two Mikes on the radio from 10 pm and I finalised my plans for my latest groundhop whilst I listened to this. I had a reasonable nights sleep, waking up at 8. After having breakfast and getting ready, I left at 9.20, the plan to get the 9.47 train out. However, a slow driver holding everyone up for a long part of my journey meant that after parking up and walking to the station, I arrived just in time to see the train pulling away. I had to wait over 20 minutes for the next one, but thankfully I was soon on my way. It was a well-rehearsed journey for me and so after a couple of changes, I arrived at Borough Market at 11.20. Of course, the New Forest cider stall was my first port of call and I sampled a couple of new ones. Both Little Pomona Old Man & The Bee and Telegraph Hill were nice and went down very nicely. I needed some food to soak it all up and always like to have something fancy when here. An Argentinian food stall called Portena fitted the bill perfectly, here I had 3 delicious Empanadas for £6.50, the best of which was the chicken. From there I made my way to the station, catching the 12.18 service to Gillingham and getting off at Dartford. I got there around 1, my first stop being the Flying Boat Wetherspoons. It turned out to be rubbish, the worst in the chain out of my 163 visited. No real cider and no spare tables for food, so I walked out. Instead, I went to The Royal Victoria & Bull Hotel. A little more expensive than Wetherspoons, but still reasonable at £9.39 for a pint of Old Rosie and a Sweet Chilli hot dog. The food was nothing special, but at least it filled me up ready for my walk to the ground. I got there at 2.15, paying £5 for entry which was fairly reasonable. 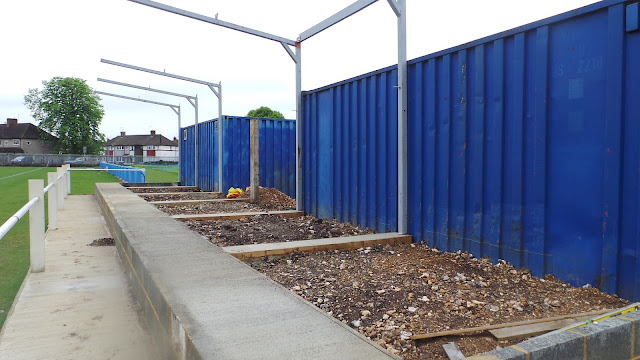 The ground was very basic, only one side open and a stand which was under construction. It had fairly pleasant surroundings though and so I had a chance to catch up on things before kick off. The game kicked off fairly late, not starting until 3.08. Chances were sparse early on but it was Forest Hill Park that were edging it. It was the hosts that took the lead on 21 minutes, Josh Williams dribbling into the area and drilling a low diagonal shot into the bottom right-hand corner. It was all square less than a minute later, poor marking allowed Damilola Olukan free reign inside the area and he finished well. 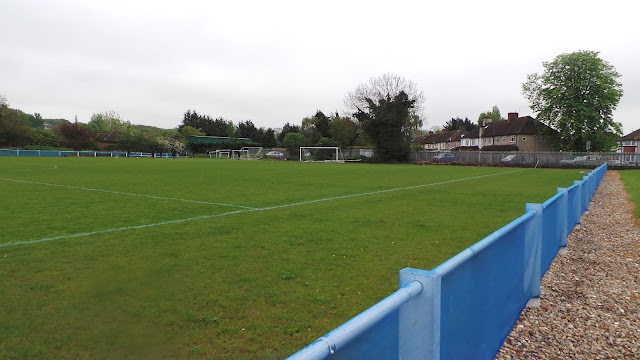 On 26 minutes Forest Hill Park took the lead, this time more ropey defending allowed Josh Read to score after he was left free in the area and slotted past the keeper from a few yards out. It stayed this way until halftime, the second half kicking off at 4.13. 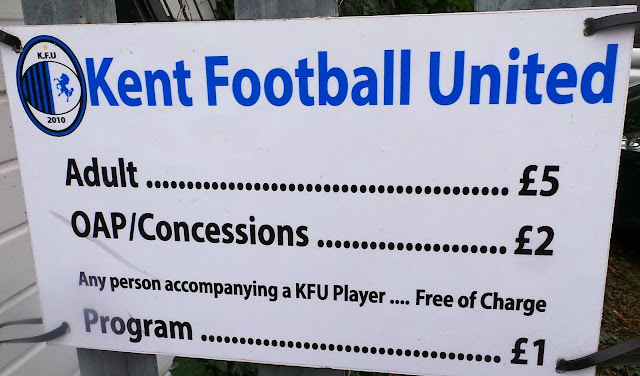 Kent Football United came out fighting and they equalised on 64 minutes through Tunde Aderonmu when he converted a low cross. On 67 minutes they were ahead, this time it was Marcus Cassius who completed a good run into with a drive into the bottom left-hand corner for what was probably the best goal of the day. The hosts completed their purple patch on 75 minutes when Aderonmu grabbed his second via a penalty awarded for a trip just inside the area. The scoring was completed on 88 minutes, the goal had a lovely build up but it was slack marking that allowed Aderonmu to complete his hat-trick. The best team won, but the scoreline was a tad harsh on Forest Hill Park who played some good stuff and sported a very smart white kit with pinstripes. Batteries on all my electrical devices were pretty much dead by now, but to be fair it was my own fault for taking a partly charged power bank with me. I went to a couple of shops to see if I could get a suitable replacement, but there was nothing available. Instead, I just got some snacks from Aldi and decided to knock the visit to the football shirt exhibition on the head. I was nonetheless in a good mood, Wycombe had been promoted at Chesterfield to return to League 1 for the first time in 6 years. I'd have loved to have gone for a few drinks, but I had driving responsibilities and an early start for work in the morning. I didn't leave Dartford until 5.50, having to wait 15 minutes for a train. After changing at London Bridge I got to Finchley Road around 7.10. I thought I was home and dry, only having to wait for a few minutes for a train to Amersham but after getting on, the train suddenly changed it's destination to Uxbridge mid-journey. Everyone had to get off and despite the driver saying that the Amersham train was a couple of minutes behind, I had to wait 15 minutes for the next one to Amersham. Annoyingly, there were no USB charging facilities for the entire journey and I was glad to get back to Amersham at 8.10. I got home 20 minutes later and put everything on charge. I toasted Wycombe's promotion with a few cans whilst I typed my blog, watching Match Of The Day after and going to bed just before midnight, despite a 4 am start the next day. 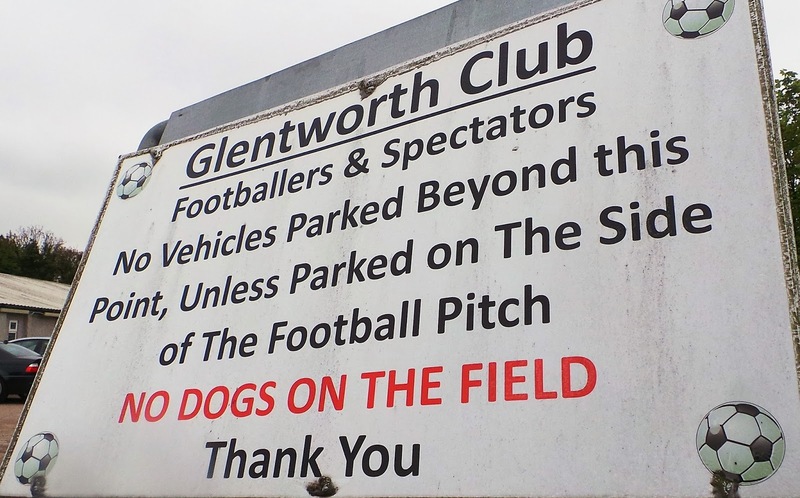 Glentworth Sports Ground is a very basic venue. Only one side is open to the public and this only has part hard standing and no cover, though a stand is under construction. 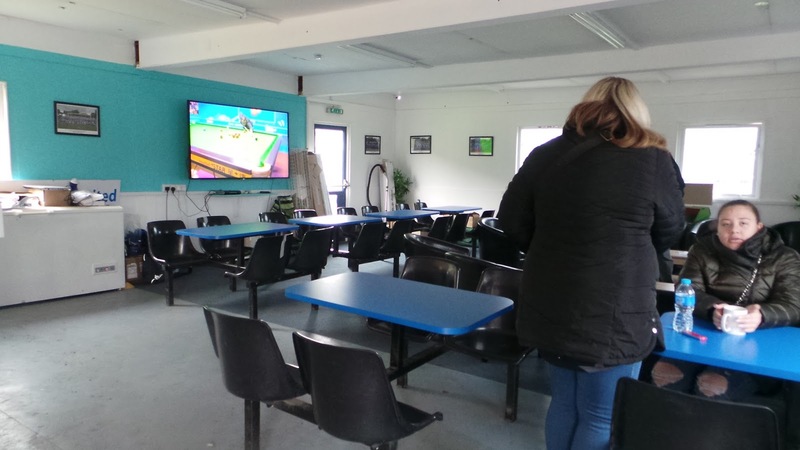 The ground is at least in pleasant surroundings with a large car park and a location near to Dartford town centre. I didn’t check out the adjacent bar or tea bar and there was no programme available on my visit.